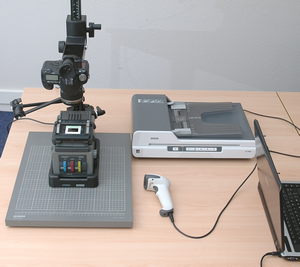 Digitization System showing light stand, slide holder, barcode reader, flatbed scanner, and computer system. 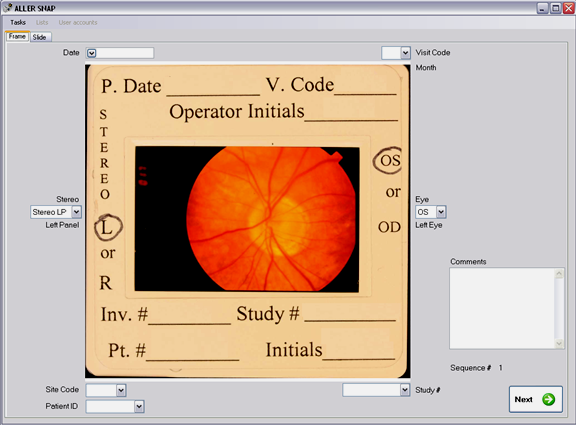 The Slide Digitization System provides the tools necessary to convert 35mm slides of single and stereo fundus images into a digital database of high resolution images and related text information. This semi-automatic system captures fundus images using a copy stand and a slide illumination holder, a high-resolution digital still camera to capture the film, a webcam to capture the whole slide including its frame, a Windows® computer, and application software. An optional scanner and barcode scanner are also available. The software enables a user to adjust the high resolution camera, snap images, enter image specific data, and store the image and data together into an image database. When capturing stereo pairs, the two images are saved in the database so that the pair can easily be displayed for stereo viewing using special glasses provided as an option with the System. For each slide, two image captures are performed. First, a low-resolution image of the entire slide is captured by the webcam (i.e., film and frame). The second image capture includes only the film portion of the slide, and is saved at the camera's full resolution (above 15 Mpixels), without any distortion and compression. After the first image is captured, the user enters the frame's data fields that are to be saved in the database. The data fields are currently configured as Date, Study #, Patient ID, Site Code, Visit Code, left or right eye, and for stereo images, left or right panel. After the user enters these data and visually verifies the quality of the captured image, the second image is captured and the two images and user entered data are stored automatically in the database. As an option, the user can read a barcode that is displayed on the back of the slide, and scan a set of medical forms on which OCT images are printed. Both information are automatically saved in the database. A second software extension enables the user to retrieve and display single or stereo pair images from the database. This extension also enables the user to query the database to retrieve user-entered information. User interface showing a 35mm slide, with data fields on its frame.